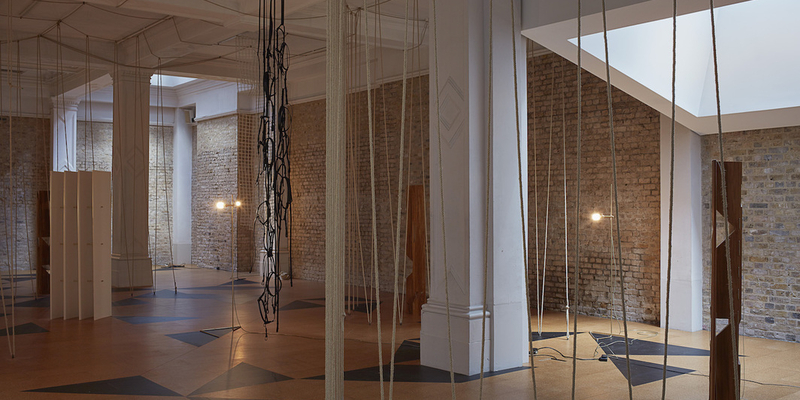 View of: “Leonor Antunes: the frisson of the togetherness,” 2017–18. Leonor Antunes’s exhibition here, “the frisson of the togetherness,” thrills as rapturously as an eagerly anticipated kiss. Her materials, forms, and techniques coalesce to stirring effect, producing an atmosphere that carefully weaves the viewer into her mesmeric installation. Soft light from freestanding lamps, which casts gentle shadows, caresses the perforated shapes that divide the gallery. Leather horse bridals sit within tangled trellises; teak panels, reminiscent of room partitions, are laced together and fan out (permutations, all works cited, 2017). They’re punctured with large, triangular apertures through which to peep. One piece of rope, titled Ernö, spans the entire ceiling and is repeatedly bound to the floor through metal loops. It feels like a modernist jungle by Charles and Ray Eames: the liana-like cordage modulates the space while enabling a sense of openness and play. It’s elegant, seductive—Antunes wants you to be aware of your own and others’ bodies as you move through the space. Her menagerie encourages a tender togetherness that subverts the quiet contemplation of the art-viewing experience. Antunes often incorporates works by overlooked women artists into her installations. Here, the drawings of British artist Mary Martin (which inspired the geometric cork-and-linoleum floor) and Brazilian artist Lucia Nogueira’s jewelry are presented in glass display cases by Nanna Ditzel, a Danish designer. Antunes reignites the past by repositioning modernism within the twenty-first century, where everyone is invited into the mix and women claim the space that they deserve.